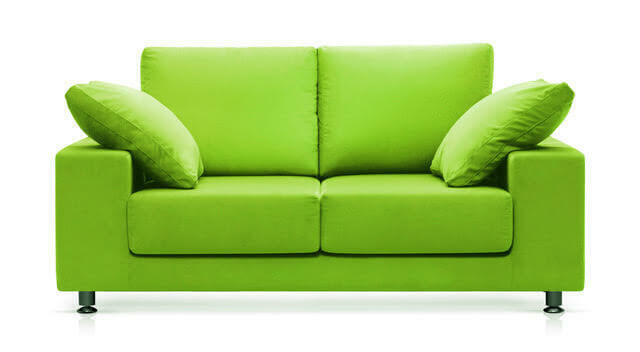 We clean all types of furniture and upholstery, from microfibers to cottons, velvet and even leather. And we do it better! Our wide range of Green Certified products along with specialized equipment, allow us to remove body oils, dirt and even those mystery spots that keep hanging around. We can often remove stains that you may have thought permanent. You do not have to buy new! Safely cleaning furniture requires more time, expertise and especially more care. Our technicians are trained to understand the right products, temperature, and pressure needed to safely and effectively clean all fabrics. Don’t trust just anyone to do this. With our equipment and expertise we can clean, protect, and restore your furniture to its former beauty. Since we remove so much of the moisture during the cleaning process your furniture should dry in about 1-4 hours. The type and thickness of the fabric, its construction, humidity and airflow will all affect the drying time. If the furniture is re-protected the drying time will be about a half hour longer. If it’s worth cleaning it may be worth protecting. We offer our Green certified protection as an option. It will help restore the fabric’s resistance to soil and stains, making cleaning and maintenance of the fabric easier and more effective in the future. If your furniture was protected when you purchased it and you’re not sure if it has worn off in areas, no worries we have a way of testing for that. Manufacturers list a recommended method of cleaning on all furniture even though the method recommended may not be the most effective. Our technicians can determine the best method for your furniture and treat it according to its fiber content. For example we may clean a certain fabric without heat because that fabric is prone to shrinking. We can do this effectively where others cannot because the green products we use do not require heat for optimal cleaning. We clean your leather by hand, using products that will soften and condition the leather, restoring it to its initial supple and luxurious feel. Leather cleaning done in this time honored way takes a little longer so allow a little extra time. Leather is very different from other fabrics and needs to be cleaned and conditioned periodically. As with fabrics the frequency depends upon the amount of use and its environment. However, since leather is more expensive initially and since soils can permanently damage leather it is wise to have it cleaned more frequently. Cleaning once or twice per year would be optimal. Dirt left on a leather surface actually pulls out the natural moisture and causes it to dry and crack prematurely, changing its appearance. There are many over the counter products advertised for cleaning leather, but not all of them are safe for you or your leather furniture. Some products may shorten the life of your leather.